Is it a coincidence that Speaker John Boehner announced his resignation the morning after his invited guest, Pope Francis, spoke to a joint session of Congress? 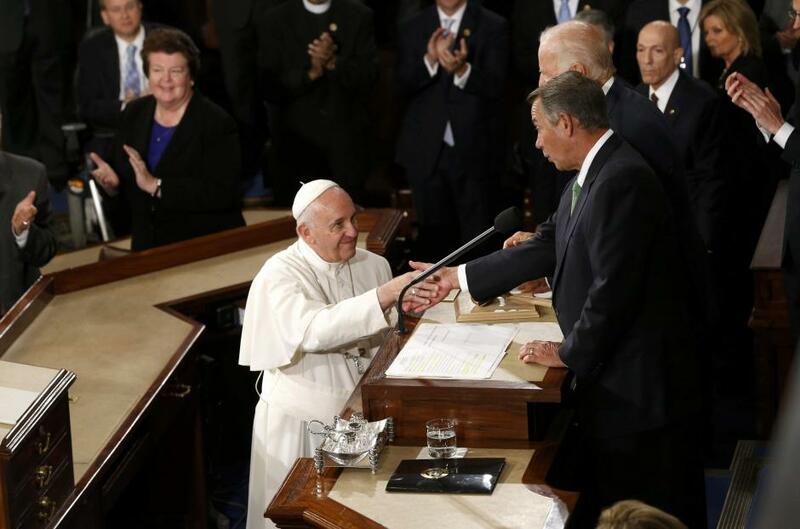 Before his address to Congress yesterday Pope Francis turned to the two former altar boys behind him on the dais. He looked quickly at Vice President Joe Biden; he looked much longer into the eyes of his host, Speaker John Boehner. It was warm but it also seemed like something else – a moment between a priest and penitent? One had to ponder Mr. Boehner’s inner turmoil listening to the Pope’s words gently reprimand leaders who forget the Golden Rule, push aside the poor, ignore or criminalize immigrants and migrants, prefer aggression to dialogue, ignore the common good for private gain, put people on death row, and refuse to act responsibly on climate change. What do you do sitting behind the Pope? You take out your handkerchief at the great privilege of hosting the Pontiff and the honor of being in his presence, but perhaps also because you recognize the prevalence of sin, as in Francis’ quotation from Thomas Merton (see quotation below) or his choice of the socialist Dorothy Day of the Catholic Worker Movement as one of four Americans to emulate. And, if you haven’t already done so in your private time with the merciful Pope Francis, you might go to confession, repent, and do penance. This morning John Boehner announced his resignation as Speaker of the House at the end of October. Preparing to speak to the United Nations in New York, one can imagine Pope Francis blessing John while lamenting Boehner’s colleagues’ loud cheering, wondering whether anyone but Joe and Johnny was paying attention the day before. This entry was posted in America, Faith, Life, Politics, Spirituality and tagged John Boehner, Pope Francis, self-contradictory hungers, the Golden Rule, Thomas Merton by Gordon C. Stewart. Bookmark the permalink. Been hearing about it all day on MPE… Almost no doubt it had an effect on Boehner…. Seems, among other things, his announcement means there is little chance of a government shutdown this year. And that is good. Amazing things and timing. In the longer run his resignation does not bode well for effective governing. His successor will not have come to Washington to legislate (i.e. work out solutions through compromise) but to take intractable positions. One can only hope that some of those with designs on the Speaker’s position took heed of the Pope’s words about power and leadership. Would that this were the case, Gordon. I can only hope that you are right. Thank you, first for noticing this, and second for writing it. Barb, Thanks for the comment. All the best!